Ozone, one of natures basic elements, is a very powerful disinfectant and deodorizer. It consists of oxygen (02) with an extra oxygen atom attached (03). Thus the only by-product of ozone is oxygen. In fact, ozone gas reverts to oxygen quite rapidly and naturally. The half life of ozone in air is on the order of hours, and on the order of minutes when dissolved in water. Kills bacteria on contact thousands of times faster than chlorine or bromine. Kills virus on contact - virus is not effected by chlorine or bromine. Kills algae spores, fungus, mold, and yeast spores. Oxidizes oils and precipitates heavy metals. Dissolves over 10 times faster into water than oxygen, then reverts back into oxygen in minutes, increasing the dissolved oxygen content of the pool water. How does the Ozonizer create ozone? The same way as the sun does in our upper atmosphere and as lightning does in our lower atmosphere. 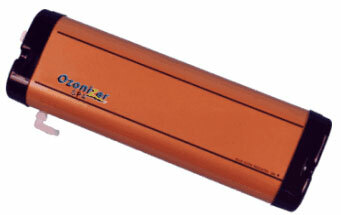 Inside your Ozonizer UV5X Ultraviolet Spa ozone generator are very high intensity UV rays like those of the sun. When air is sucked through the unit's UV chamber the result is a partial conversion of the oxygen in the air into ozone. The Ozonizer CD4500 Corona Discharge Pool ozone generator creates ozone by producing a high voltage electric arc in much the same fashion as lightning. How does ozone get in the water? The Ozonizer pool unit has an optional venturi assembly which emits ozone gas into the water, and is installed in your pools plumbing. The Ozonizer Spa has a fitting mounted into the spa's air valve and the ozone is sucked through the tube and injected by this valve into the water. Ozone gas is a strong oxidizer which "burns up" algae, bacteria and virus similar to the way chlorine and bromine does. However, ozone dissipates out of the water within minutes and thus leaves "softer" water much more pleasurable to swim in. Do I have to oxidize or shock my spa with chlorine? Under normal usage no; however, under heavy bather usage where "cloudy" water is prevalent, it is advisable to shock with 1 cup household bleach for Spas and 1 gallon for Pools, or you can use a non-chlorine oxidizer such as potassium monopersulfate per manufacturers instructions. What other chemicals are needed in my spa or pool? pH and alkalinity chemicals (acid or base) are required to keep your water acid balanced properly.